The vision is built on the unique capabilities of gallium nitride (GaN) optoelectronics to combine optical communications with lighting functions, and especially on the capability to implement new forms of spatial multiplexing, where individual elements in high-density arrays of GaN based light emitting diodes (LEDs) provide independent communications channels, but can combine as displays. 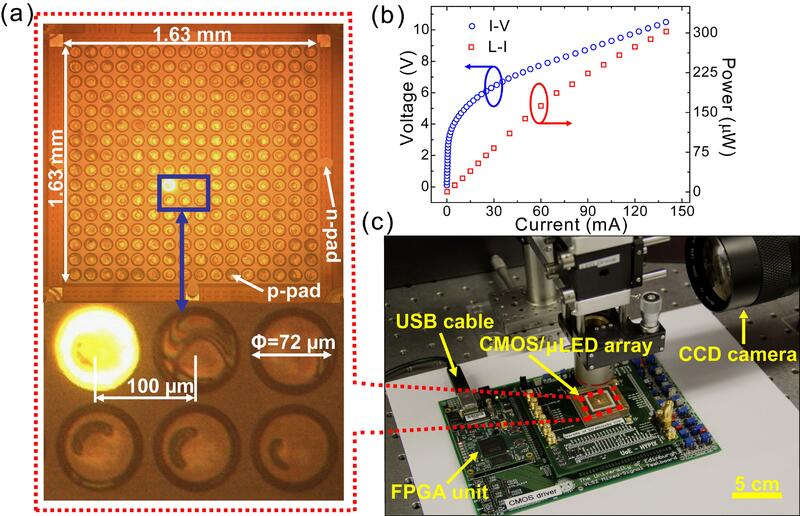 We envisage ultra-high data density - potentially Tb/s/mm2 - arrays of LEDs driven via CMOS control electronics in novel addressing and encoding schemes and in compact and versatile forms. The project is a partnership between 6 research groups at 5 institutions. Recently, by integrating CMOS electronics with GaN based micro-LEDs, we have developed CMOS-controlled color-tunable smart displays. The color-tunable LED pixels in these displays have a modulation bandwidth of 100 MHz, thus providing simultaneously a wavelength-agile source for high-speed visible light communications.